New websites are helping people to visualize sea level rises which is one of the most prominent features of global warming. This issue is highlighted by recent research indicating that the melting glaciers in Antarctica have hit an irreversible tipping point. Sea level rises have also been predicted by scientists all around the world including the most recent Intergovernmental Panel on Climate Change report, most comprehensive scientific summary of climate change to date. There are two new websites that help people to visualize these rising sea levels. One of these sites is called, "World Under Water," it provides a virtually limitless assortment of graphic illustrations. This website was created by environmental crowdfunding platform Carbon Story. It combines Google Street View images with wave graphics to demonstrate how rising sea levels might affect the world's most famous landmarks and cities. 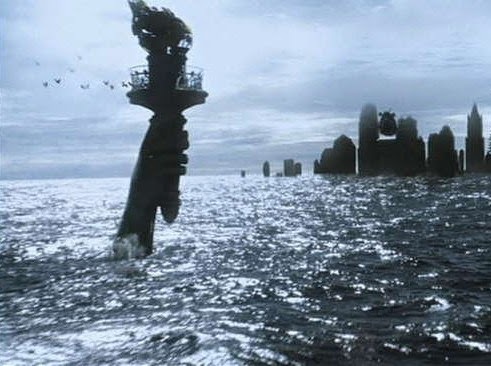 At the site you can see what cities like New York, Los Angeles, Miami, Moscow, Rome, London, Paris, Dubai, and Vancouver would look like if they were under water. You can also type any address in the world and take a look at what it would look like inundated by water. While the images provided are not scientifically derived, they do help to graphically illustrate what the world will look like as sea levels rise. "World Under Water," goes beyond startling images of global flooding, it invites people to be part of the solution by helping them to calculate and offset their carbon footprints. Surging Seas, is another site which is derived from scientific data that estimates where seas will rise and by how much. This site is run by the nonprofit Climate Central. For certain cities, it even has data on population density, property value and social vulnerability of different neighborhoods. Of course this is more than a consciousness raising exercise, these sites are meant to encourage action. Ultimately this means changing our current trajectory and specifically reducing man made greenhouse gas emissions. These sites show that how we will be effected by sea level rises if we continue with business as usual and this has a whole cascade of impacts from serious food shortages to widespread conflict. To go to World Under Water click here.